One of the fundamental distinctions we need to make when working with people who experience pain is to understand the difference between experiencing pain – and the behaviour or actions or responses we make to this experience. This is crucial because we can never know “what it is like” to experience pain – and all we have to rely on as external observers is what we see the person doing. Differentiating between the various dimensions associated with our experience of pain makes it far easier to address each part in the distinct ways needed. Let me explain. We know the current definition of pain – an unpleasant sensory and emotional experience associated with actual or potential tissue damage, or described in such terms (IASP, 1979). One of the key points of this definition was to remove the need for nociception as a requirement for pain to be present. So when we unpack what we understand about pain, the first step is to recognise that it’s an experience. Something we can never share with another person – just like we can’t share joy, the taste of a great craft beer, or what a lover’s touch is like. We therefore have an inexact relationship between two concepts: nociception, or the biological mechanisms at play until the point at which we are conscious of pain; and pain, or the experience of what it is like to have an unpleasant sensory and emotional experience associated with actual or potential tissue damage, or described in such terms. But wait, there’s more. Given that this experience is a subjective, internal and personal experience – how do we know when someone is experiencing pain? When I ask students, their answer is “oh you can see grimacing, wincing, or they tell you” – and it’s true! But let’s notice something: they’re all behaviours. Things people do, either involuntarily or voluntarily, to signal that they’re sore. Behaviours or actions are not a direct indication of “what it is like” to experience pain. Like nociception and pain, there is an inexact relationship between what someone does when they’re experiencing pain – and their resultant behaviour. So we now have three somewhat overlapping concepts: nociception (biology), pain (experience), and behaviours (actions). They overlap because there is no direct 1:1 relationship between these concepts – although in some cases it may seem like there is. What else influences our pain experience? If you’ve been paying attention to my blog these last few weeks, you’ll know that thoughts or beliefs and emotions also influence both our experience of pain and our behaviour. For example, if we know that the pain we’re experiencing is for good (such as post-surgical pain after hip replacement), we tend to be more forgiving, or at least more willing to experience it than if someone attacked us with a scalpel down some back alley! We have plenty of evidence that simply knowing the supposed cause, and something about the biology of pain, can help people to feel a little differently about it (emotions), and to move differently (behaviour) (Moseley & Butler, 2015; Tegner, Frederiksen, Esbensen & Juhl, in press), while emotions in both experimental and clinical studies have been shown to strongly affect pain intensity – and subsequent behavioural responses (Orenius, Raij, Nuortimo, Naatanen, Lipsanen, & Karlsson, 2017). Once again, the relationships are not exact – which is almost always the case when we’re studying complex systems! Because thoughts, beliefs and emotions have both impacts on nociceptive processes and on pain experience and behaviours, I’ve depicted them as overlapping (if there was a way to show this in 3-D believe me, I would!). We know context makes an enormous difference to a person’s experience of pain AND the behaviours they take in response to their pain. While contextual factors don’t directly influence nociception, these factors do influence thoughts and beliefs, emotions, and behaviour. For example, we know that in adolescents with pain, parental responses influence the amount of treatment seeking (Stone, Bruehl, Smith, Garber & Walker, 2018); and that spouses or partners of people living with pain can affect both pain intensity and behaviour because of the way they interact (Burns, Post, Smith, Porter, Buvanendran, Fras & Keefe, 2018). We also know that in different communities, responses to pain can differ: people who pursue body suspension (being pierced and suspended by hooks) are supported by those around them to “hang in there” (no pun intended!). Factors such as legislation make a difference to pursuing treatment, while treatment itself can perpetuate disability and may even increase attention to pain. Why bother explaining all this? The implications of understanding these associations are quite profound. Firstly, nociception is a small but important contributor to our pain experience. Most pain starts with a nociceptive stimulus, even if it ultimately ends up less influential than cortical ‘interpretive’ processes. Secondly, the experience we have of pain is something we can’t share – and thirdly the only way we can begin to infer that another person has pain is via their behaviours, or what they do. This means pain measures like the visual analogue scale, FACES scale, numeric rating scale are not direct measures but are used by people to give a message about their pain. All behaviour is influenced by both our thoughts/beliefs and emotions and contextual factors including who is nearby, past responses they’ve made to our messages, what’s normal or expected in various contexts, and the purpose we believe our behaviour will serve. And of course, many of the influences and behaviours we do are not things we’re consciously aware of because we’ve been doing them since we were born. So when I think about what we might do to help someone with their pain, I firstly acknowledge that I can’t directly influence someone’s own experience. I’m working to influence what they do about their pain, their relationship to their pain, their beliefs and understanding, their emotions and how they communicate this to other people around them. And to me, the first step is being ready to hear what people believe about their pain. Only after I’ve successfully conveyed this to the person can I ever begin to come alongside them to help them change what they do. Burns, J. W., Post, K. M., Smith, D. A., Porter, L. S., Buvanendran, A., Fras, A. M., & Keefe, F. J. (2018). Spouse criticism and hostility during marital interaction: effects on pain intensity and behaviors among individuals with chronic low back pain. Pain, 159(1), 25-32. Orenius, T. I., Raij, T. T., Nuortimo, A., Näätänen, P., Lipsanen, J., & Karlsson, H. (2017). The interaction of emotion and pain in the insula and secondary somatosensory cortex. Neuroscience, 349, 185-194. Porreca, F., & Navratilova, E. (2017). Reward, motivation, and emotion of pain and its relief. Pain, 158, S43-S49. Stone, A. L., Bruehl, S., Smith, C. A., Garber, J., & Walker, L. S. (2018). Social learning pathways in the relation between parental chronic pain and daily pain severity and functional impairment in adolescents with functional abdominal pain. Pain, 159(2), 298-305. Tegner, H., Frederiksen, P., Esbensen, B. A., & Juhl, C. (2018). Neurophysiological pain-education for patients with chronic low back pain-a systematic review and meta-analysis. The Clinical Journal of Pain. I am mightily bothered by health professionals’ lack of knowledge about pain. Perhaps it’s my “teacher” orientation, but it seems to me that if we work in an area, we should grab as much information about that area as possible – and pain and pain management is such an important part of practice for every health professional that I wonder why it’s so often neglected. So, to begin exploring this, I completed a search looking at occupational therapists’ knowledge of pain – and struck gold, kinda. Angelica Reyes and Cary Brown conducted a survey of Canadian occupational therapists, to explore how well occupational therapists knew their stuff. Members of the Canadian Association of Occupational Therapists were asked to participate and a total of 354 therapists (mainly from Ontario, Alberta and Nova Scotia) took part. Curious that few were from British Columbia where I know of quite a few occupational therapists working in the area, but there you have it. Over half of the respondents had 10 years or less experience – so they were fairly recent graduates and should reflect a “current” educational bias. Only 5% of the total number of members of CAOT responded, so this is a fraction of the occupational therapists working in Canada – but you’d think the motivated (ie knowledgeable) would be more likely to respond than those who don’t work in the area…. prevalence ofpatients who are likely to become addicted if treated with opioids. Of particular concerns was 45.7% of participants believed that malingering is common; 38% believed that pain intensity can be objectively measured, 39.7% believed people with pain over-report their pain, and 59.8% believed that opioid addiction is likely to occur in more than 5% of the patient population. So, it seems that these occupational therapists had some very outdated ideas about pain, and in particular, seem to have missed the point that because pain is a biopsychosocial experience, we have no way to determine whether someone is “faking” – or malingering. Now, I will lay good money on a bet that if we were to carry out this very same survey amongst any other health profession, we’d still arrive at these rather unsavoury findings. Folks, I live in a pain nerd bubble and I still hear these kinds of discussions amongst knowledgeable health professionals, so it’s unsurprising that so many people hold these beliefs. Beliefs that will hamper developing good relationships with the people we want to help, and beliefs that fly in the face of what we know about pain. Prevailing attitudes within the healthcare community are that pain is a difficult area to understand – and “should” be treated with medication or surgery otherwise…. You can see that this year’s IASP Global Year for Excellence in Pain Education has much to do. Did you know that IASP have produced NINE comprehensive curricula – including occupational therapy (thank you to Emeritus Professor Jenny Strong, Professor Cary Brown and Dr Derek Jones for developing this wonderful resource). This means there is no reason for us not to begin integrating this import area of practice into our undergraduate training. Research examining occupational therapy’s contribution within pain management is in its infancy – but oh how my occupational therapy heart went pit-a-pat when, at the Australian and New Zealand Pain Society Scientific Meeting I presented alongside two other occupational therapists with PhD’s (or nearly there!) to a room full of clinicians, not just occupational therapists. While we have little specifically occupational therapy research, occupational therapists have been and are continuing to be part of research efforts around the world. And what clinicians do is apply what is learned into the daily lives of the people we work with. That, friends, is what occupational therapy is about – helping people live full, rich lives doing what’s important to them. Reyes, A. N., & Brown, C. A. (2016). Occupational therapists’ pain knowledge: A national survey. Disability and Rehabilitation: An International, Multidisciplinary Journal, 38(13), 1309-1317. Rochman D, Herbert P. Rehabilitation professionals knowledge and attitudes regarding pain (COBS). Accessed 18 March 2015. Available from: http://prc.coh.org/html/rehab_professionals.htm. 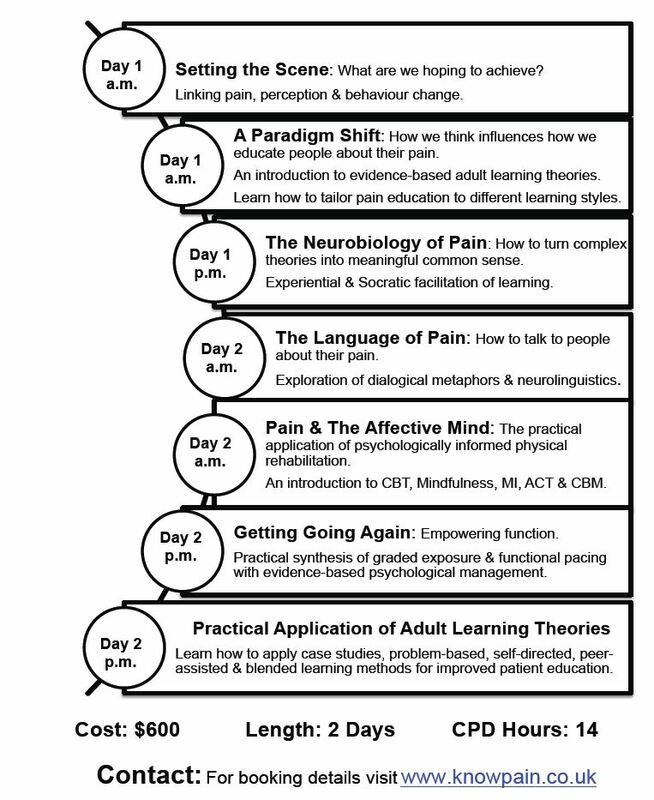 In the excitement of helping people understand more about pain neuroscience, which I truly do support, I think it’s useful to reflect a little on the history of this approach, and how it can influence the experience people have of their pain. If we go right back to the origins of pain self management, in the groovy 1960’s and 1970’s – the first truly significant work in chronic pain self management came from Wilbert Fordyce (Fordyce, Fowler & Delateur, 1968). Bill Fordyce was a clinical psychologist working in the Department of Physical Medicine and Rehabilitation, University of Washington, Seattle, Washington. He noticed that when people were given positive reinforcement (attention, and social interaction) for “well” behaviour, and ignored or given neutral responses to reports of pain, their “up-time” or activity levels increased. Interestingly for occupational therapists, in the paper I’ve cited, occupation was used as an integral part of the programme and occupational therapy was a part of the programme (somewhat different from most clinics nowadays!) Thus the operant conditioning model of pain behaviour and disability was first developed. As practice progressed, clinicians began discussing the gate control theory of pain to help people understand how incredibly powerful descending pain modulation could be. Included in those discussions was the distinction between “hurt” and “harm” – that simply because something hurt, did not mean it was a sign of harm in the tissues. As the 1980’s wore on, interdisciplinary pain management programmes became popular, with much of the work involving helping people reappraise their pain as “noise in the system”, and encouraging participants to develop strategies to increase activity levels and at the same time employ approaches to “close the gate” and thus reduce pain intensity. I started working in pain management in the mid-1980’s when not only did I develop a patter to explain gate control, chronic pain, the relationship between the brain and what was going on in the tissues, I also started using the case formulation approach I still use today. The key effects of this approach were pretty profound: people said to me they had never realised their pain wasn’t a fixed thing. The commonplace examples I used to explain why the relationship between their pain and what was going on in the tissues was complicated and uncertain made sense – everyone had heard of phantom pain, everyone knew of people who played rugby and didn’t feel the pain until after the game, everyone had heard of hypnosis for pain, and people also recognised that when they felt bad, so their pain felt worse but when they were busy and happy doing things, their pain was less of a problem. Now the interesting thing is that during the 1970’s, 80’s, and 90’s, there was still a lot of talk about ways to abolish chronic pain. Loads of nerve cutting and burning, lots of surgical fusing and metalwork, heaps of pharmacological strategies were all the rage. People felt sure there was a way to stop all this chronic pain from appearing – and the answer was to begin early, before pain behaviour was established, before people got the wrong idea that their pain was intractable. As a result the “yellow flags” or psychosocial risk factors for chronicity were developed by Kendall, Linton & Main (at least in NZ). This created a great flurry of ideas about how to “get people moving”, and “assess and manage yellow flags” which have subsequently flourished and become a veritable rainbow of flags. When we begin to untangle some of the elements involved in our experience of pain, we can see that at least part of the “yuk factor” of pain lies in our appraisal or judgement of what the pain signifies. Let me give you an example – say you were walking down a dark alley and someone approached you with a loaded syringe. They stab you with the needle! What do you do? Well – probably you’d run for the nearest Emergency Department, and my bet is that you’d be well aware of the sting of the needle as it went in. Now think about the last time you got your flu jab – same stimulus, but your response is likely to be quite different. You’ll notice the sting of the needle, but it will quickly fade, and you’ll generally be calm and matter-of-fact about it. Your appraisal of the sting is quite different from what I guess you’d be thinking if you’d been stuck by a needle in a dark alleyway. When people are asked to rate their pain intensity, at least some of the “score” given on a visual analogue scale can be attributed to the “distress” portion of the pain experience. The part that we can attribute to “what this experience signifies to me”. And this is the part that an explanation about pain can influence – and thus pain intensity ratings can and do drop once a helpful explanation is given. BUT it does not change the biological elements, nor the “attention grabbing” aspects of pain (well, maybe the latter can be a little bit changed because if we don’t think of the experience as representing a threat, we can more readily put it aside and focus on other more important things). Do I think it’s important to explain pain neurobiology? Most of the time, yes. But we need to do this with care, compassion and sensitivity. We need to think about why we’re doing it. And we need to recognise that for some people, explanation doesn’t change their pain intensity, it just changes their judgement about the meaning of their pain – and if their concerns are about the effect of pain on their life, then an explanation may not be the most useful thing. And most of all, we need to remember that reducing pain intensity is not really the most important outcome: doing more is probably more important. Words are never enough – but does that stop us? Language is not just words, but what those words symbolise. We use movements of lips, tongue and throat to produce symbols we relate to other things. We then use the relationships we learn through symbols to frame or structure our experiences – language is a “form of cooperation that builds on the social nature of humans groups and enhances a culture of eusociality in which humans thrive” (Villatte, Villatte & Hayes, 2016. p. 28). What this means is that humans learn to connect concepts together through language which represents concepts only because of a shared social understanding – and in sharing this understanding we feel connected. Why am I talking about language? Well, relational frame theory is a theory of human behaviour that helps us understand how language can exert an influence on us through the way we understand symbolic relations.We learn symbolic relationships by interacting with our world – children learn concepts of “I – you” (that you and I are different, but that I can take your perspective by imagining I was in your place); “here-there” (that here is where I am, but there is another place – and I can move to that place); “now – then” (what is happening now will become then soon) by handling objects, ultimately understanding that the concepts only make sense within the context of “here”, or “I”, or “now”. To be empathic, we need to learn to take the perspective of another, see and feel things from another person’s point of view, and be willing to experience those feelings (Villatte, Villattee & Hayes, p.32). To be empathic to another’s pain, we need to take the perspective of another, to be willing to experience “what it might feel like” from the other person’s shoes. Why are symbolic relations important? In Christchurch, as many people know, over the past five years we have been through over 10,000 earthquakes of more than 3 on the Richter Scale. The thought of having an earthquake, to someone raised in NZ, is a distinct possibility. We have small ones all the time. Then in September 2010 we had the first big earthquake. It happened in the middle of the night (early morning), when all was dark, and it was violent! Later that day we had many aftershocks, and I can remember my heart pounding and feeling anxious in the aftermath. What has happened since, though, is that I’ve learned to associate the word “earthquake” with a whole lot of concepts – a rumbling noise from a truck driving past, the deep rumble of earthworks, EQC (our national insurer), road cones, detours, heritage buildings being knocked down, having no water or power. I keep a look out for exits, I brace at the rumble of a truck, one of the topics of conversation is “how is your house” and I remember the fatigue of constant aftershocks in the middle of the night. Learning the associations (symbolic relations) between the experience at the time of an earthquake and all these other things such as words, movements, actions and emotions means that as a person living in Christchurch, the word “earthquake” and the sight of road cones and the rumble of a truck have all gained additional meaning or salience to me. Simply by remembering a particular day (for us it was September 22, 2011), or by looking at a road cone, or diggers operating in a trench in a road, I have emotional, cognitive, motivational and perceptual responses. This is the power of a symbol, once learned. And once learned, that association will never be unlearned – I will always remember that trucks rumbling by sound a lot like the start of an earthquake, and I will probably always have a quick little bracing response that I may not even notice (but hitch me up to biofeedback and I’ll be skin conductance will be increased). What does this have to do with pain? In the same way that I learned about earthquakes being associated with a whole bunch of things that hadn’t been connected before September 2010, from the time we are born we develop associations between our experiences of pain and other things including language. For the most part we learn that pain is associated with something not so good happening to our body. We learn that it’s something we don’t really want to experience, and so we try to avoid it (mainly). We learn words that are associated with that experience – “ouch!”, “hurt”, “painful”, “ache”. We also develop emotional, cognitive, motivational and perceptual responses to this experience. We learn that certain movements bring pain on, while others alleviate it; we learn that some people respond with sympathy to our words or movements while others don’t respond. The thing about symbolic relations is that “the simplest act of remembering by using names and symbols … means that anytime, anywhere, we can remember past painful or difficult events based on a few cues…the past can become present through symbolic relations” (Villatte, Villatte & Hayes, 2016, p. 33). While nonhuman animals can become fearful in situations that are similar to those they’ve felt threatened in, humans can experience the same emotions and responses even when a word is spoken – like earthquake for me brings on a heightened awareness of how vulnerable I am when the ground shakes. What this learned association means is that for all humans, there are many cues that will elicit the same response as the actual event. And given the ubiquity of pain and the words we use to describe pain – and the associations we develop since we’ve been children – it’s no wonder that changing some of the more unhelpful associations and responses we have to the experience is a challenge. Over the next few weeks I’ll be posting about relational frame theory and how this theory can help us understand why words can be used to help – and harm – and how to implement useful verbal strategies in sessions to help our clients see their pain from a different frame. I’ve delayed writing about the San Diego Pain Summit to allow my thoughts to settle and to come up with a suitable distillation of the event. Good things take time to brew! Impressions of San Diego – city of warmth and light, food and water and the sea… A lovely place to visit, and one that I would almost be happy to live in. But the setting was the least attractive aspect of this most excellent gathering of pain peeps. For me, first time attendee, it was like a gathering of the best of friends all in one place with plenty of time to geek out on pain science – and to put faces to names that I’m so familiar with that I feel like we’ve been friends for ever! First off, hat tip to Rajam Roose who single-handedly organised this event. Without her vision and organisational strengths I would have missed a highlight of my career so far! Rajam was the most personable hostess, making sure I was picked up from the airport, fed and then dropped off at the hotel, taking photos to share on Facebook as I JUST GOT OFF THE PLANE after at 19 hour flight from New Zealand. Seriously, Rajam and her wonderful man (and assorted friends both furry and not) made my arrival welcoming and wonderful. And this is probably one of the nicest things from the whole San Diego meeting – feeling welcomed, at home, and amongst friends. And this despite my being the only occupational therapist at the meeting! Come on, occupational therapists, you really need to get your collective acts into gear! The Pain Summit is probably the only meeting I’ve been to where everyone, no matter what background, whether body-oriented, brain-oriented, disability or function-oriented – is accepted, encouraged and enriched. Occupational therapists would feel right at home. And now, to review the meeting itself. Well, to be honest, the meeting WAS about the people. The discussions had between different professionals from differing backgrounds and theoretical orientations, all focused on learning more about pain and how to better help people who experience pain. While the speakers were outstanding, without the community discussions, both on and off-line, I think this meeting would be much like any other. The hallmark is that the people who attend are committed, passionate and really think about the meaning of new research and how they can apply it. I’ve talked about a community of practice before. A community of practice is a group of people who have developed a commonality in how they tackle their work. Where theory and practice are connected in the most intimate ways. Where each piece of evidence is examined in the light of the question ALL research should be evaluated against: So what? So what does this mean for ME? So what can I use from this? So what does it mean that this – and this – are both true? So what questions do I need to ask myself? The Pain Summit is a place where choices don’t have to be made. It’s designed so that people can attend every session, rather than having to choose a stream (and miss out on the other stream). And one where ethics hold out over money-making. Rajam doesn’t want to have to take sponsorship if this means the Summit has to compromise on any information presented. It’s designed so that clinicians can meet the presenters and talk. Where presenters engage with one another and with the attendees. The most profound talks for me personally were Lehman’s take on biomechanics – when it applies, and when it doesn’t. Argued from a biomechanical perspective. And Benedetti’s talk on placebo and the mechanisms that skew randomised controlled trials of new pharmacological and surgical agents (yes, I know placebo is a thing affecting ALL treatments, but much more difficult to study in nonpharmacological approaches). I was saddened to hear that yes, if we persist in using the WHO Analgesic Ladder, we may be inadvertently doing harm because repeated ineffective treatments can establish negative expectancies from ALL treatments – hence my take on identifying the pain mechanisms involved and providing targeted therapy specific to those mechanisms rather than a “multimodal” approach that may not provide much at all. The argument Benedetti made was that medications that don’t work create a learning effect in the recipient, reducing the potential for subsequent treatments to be effective. So if you have fibromyalgia, probably the archetypal “central sensitisation” pain problem, treating it with NSAIDs and codeine and other opiates isn’t likely to do anything wonderful – why not begin with the tricyclic antidepressants and gapabentin/pregabalin first? I also loved Alison Sim’s work on presenting CBT for pain, clear, precise – and engaging. And yes, anyone can integrate it into daily practice. The appetite for “psychological” approaches amongst this largely hands-on audience was amazing. Kevin Vowles impressive presentation on the futility of many approaches to “get rid of pain” and the usefulness of values-based action (using ACT) (and his wonderful workshop on ACT) made my day. Between them and Sandy Hilton’s discussion of ways to work with people who have pelvic pain, and I began to feel like this group of clinicians really knows that PEOPLE experience pain, not limbs or body parts. And to help PEOPLE we need to BE people – human connectedness is so important. There were many other talks, but these were the ones that really stood out for me. I’m now impatiently waiting for the video recordings so I can relive the moments of the Pain Summit and pick up on the many, many details of talks I haven’t mentioned. I haven’t mentioned them not because they weren’t great, but because the ones I’ve listed resonated particularly with me in my own orientation. Next year – will you be there? I hope so – I’ll be there, and I’m looking forward to being amongst friends again – and keeping that discussion going on Facebook, Twitter, SomaSimple in between. I’ve been touring North America – Chicago, Toronto, Edmonton and Vancouver. As I’ve toured I’ve been listening to the stories of change and insight as different professions review their contributions to effective pain treatment. Some things change, some things stay the same – but as the quote above indicates, change isn’t comfortable nor free of conflict. What have I found in my travels? There’s a great deal to be proud of in our approaches to helping people who live with pain. Allied health practitioners of various backgrounds have adopted and adapted to the discoveries about how people experience and deal with their experience of pain. There’s been enormous change in our views of pain as neither a form of mental illness (or malingering, or imagination, or even simply weakness of spirit), nor a lifelong static state. Allied health practitioners of every kind know that they can contribute to helping people make sense of their pain, perhaps change their experience and reduce the distress and disability that living with pain can bring. Disturbingly, though, I heard the exact same issues as those I face in New Zealand, when it comes to unrest and disquiet about competence, scope, and funding for effective treatments. Disquiet because some of the different professions lay claim to certain areas of practice as “theirs”. Disquiet because there are attempts to limit access to learning about aspects of pain that are integral to the experience and management of pain. Concerns that some clinicians might be overstepping their scope when they begin to develop skills in, most notably, psychosocial aspects of our experience of pain. And disproportionate funding given to short-term (primarily) biomedical interventions without a consistent or even logical argument for similar funding levels to be applied to allied health approaches. Or worse – funding given to those working in a single-discipline approach, and loss of funding (or funding not even considered for) approaches where teamwork is a critical part of the treatment. As a somewhat renegade occupational therapist with a MSc in psychology, PhD in health sciences, and great interest in psychosocial aspects of pain, I know that I don’t sit especially comfortably in one little box. And it was SO refreshing to find that I’m not alone in this. As allied health professionals develop knowledge and skills in a biopsychosocial and neurobiologically sophisticated model of pain, it becomes increasingly difficult to distinguish between the practice of good occupational therapists, physiotherapists, massage therapists, psychologists, nurses and social workers when working with people who live with pain. Our aims are the same: we want to help people live good lives despite experiencing pain. Some of the ways we ALL do this are to help people reconceptualise pain as something that is not fixed but can be influenced by reducing the threat value of the experience within the context of what we view as important. We ALL draw on learning theories, influencing beliefs and attitudes, consider contingencies and work at reducing the relationship between experiencing something inherently unpleasant and avoiding that experience. We ALL help people set goals, work hard to achieve them, use movement and activity to help pursue what is valued and deal effectively with what gets in the way of this. We ALL use motivational approaches, we ALL consider personal values and choices, we ALL want the people we work with to have the freedom to choose personally-valued goals and outcomes. We ALL draw freely on the published scientific literature across all the branches of pain research – biological, psychological, and to a lesser extent, sociological. (I’d love to see far more emphasis on the social as I’m sure regular readers know!). It confuses and perplexes me that each one of our professional groups has, at times, criticised other professions for failing to address or consider the aspects of pain experience that our particular group sees as critical. But what really perplexes me is that once another profession begins to take up the challenge of adopting and integrating learning from “outside” their original knowledge base, some people turn right around and begin to criticise that group for “working out of scope”. It does not make sense. A discussion that I think needs to begin is to consider the merit of a specialist “certification” if you like, for those people who have taken time to learn about pain in-depth, and who no longer fit as comfortably within their original profession as they once did. As I saw so often in my travels, when we get beyond the simplistic level of learning about pain as a biopsychosocial experience we begin to recognise that the way we work with people changes over time to become so much more similar than dissimilar that our professional disciplinary approaches seem to fade away. I know that in the years since my original training and graduation as an occupational therapist (waaaay back in 1983) I’ve done so much more learning and development that what I do now is so very different from what I did then. I’m still essentially interested in helping people do what is important in their lives. Doing, or occupation, is integral to my practice. The ways I help people achieve this (thus reducing distress and disability) has changed but my “domain of concern” (old-fashioned language for “what I’m interested in”) is still occupation, or the things people want and need to do in daily life. The obstacles to participating in occupations might be addressed in slightly different ways, but I draw on the same fields of knowledge that I drew on in 1983. Just as I learned then that biomechanical, kinesiological, anatomical, biological, psychological, social, anthropological – and the rest – ways of understanding human behaviour informed the way I work with people, I STILL draw on those same fields of knowledge. The first three fields might have less influence now than I thought they did when I first started working in pain management, but they all contribute. I truly thing we can do a much more effective job if we remember that while we let go of some things that we think of as “ours” we might have made just a little room to add some new skills to our own repertoire? And perhaps that change might happen more smoothly if we were more accepting of the need to let go some control and trust a little more. Mike “KnowPain” Stewart is coming to New Zealand! I’m very proud to announce that Mike Stewart, Clinical Specialist Physiotherapist in pain management for East Kent Hospitals University Foundation NHS Trust is coming to New Zealand to take three of his award winning Know Pain Workshops for allied health professionals. Mike is widely known amongst the pain clinicians, particularly physiotherapists on social media, and is a keen advocate of therapeutic neuroscience education (TNE) as a means for improving health outcomes for people with chronic pain. Therapeutic neuroscience education is a key component of the Moseley and Butler Explain Pain approach to pain management, and there have been numerous research papers demonstrating effectiveness of this approach. Mike is coming to New Zealand (Auckland, Wellington and Christchurch) at the end of April, beginning of May 2015. Workshops are also being held in Auckland and Wellington. These workshops are supported by AUT University and University of Otago.